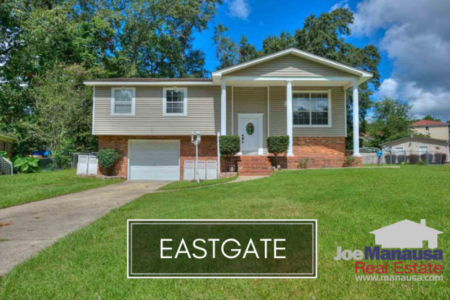 For more than forty years, median home buyers have been drawn to Eastgate in Northeast Tallahassee. Situated inside of I-10 on the East side of Capital Circle, this popular neighborhood is close to shopping, transportation, and many wonderful dining establishments. In fact, many residents love the fact that there is much to do within walking distance of Eastgate. Last year, there were more homes sold in Eastgate than in any year prior going all the way back to 2001, so today's report should not be too shocking to discover that far fewer homes are selling. 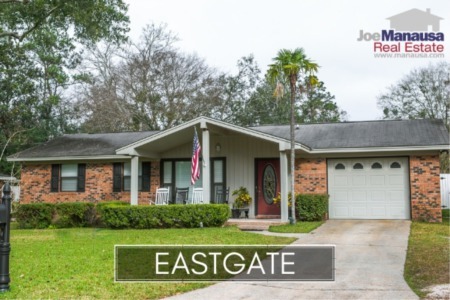 But if you are looking to buy a home for under $200,000 in Tallahassee's popular Northeast quadrant, you should bookmark this page and continue to check for updates on homes for sale in Eastgate. In this report, we will look at home prices, home values, and home sizes in Eastgate, as well as show current listings in the Tallahassee MLS and all closed home sales going back to 1991. It is important to note that the narrative contained below is for sales through December for all previous years, but through mid-month of August in 2015. The graphs and the closed sales table will be continuously updated into the future (meaning bookmark this page if you always want to know the current status of homes in Eastgate). Home prices rebounded strongly in 2014, with the average closed home sale recorded at $142,400. The two sales so far in 2015 sold for roughly 3% more, but two home sales hardly suffice for a trend. Last year's pace of home sales was the best Eastgate has seen since 2001, so this year's slow pace is not a big shock. With only two homes sold and just two others on the market, 2015 looks to be a very slow year for home sales. Average home values in Eastgate rose 15% in 2014, bringing averages back to levels last seen in 2008. This year's continued rise requires more sales to validate. One sale this year was recorded at $140 per square foot, while the other more recent sale closed for $108 per square foot. The resulting "average" is higher than all prior years other than the average recorded at the peak of the market in 2006. The average home size sold in Eastgate typically falls in a range of 1,200 to 1,500 square feet, but this year's two sales would represent the lowest on record at 1,187 square feet. I suspect we'll see the average size of homes move back up into the normal range once a few more sales are recorded. The following list shows home sales going back to 1991 in Eastgate. I hope you enjoyed our August 2015 update on home sales in Eastgate, please feel free to drop me a note if you have questions not covered in this report.